“Don’t” has certain limitations in shaping behavior. Any parent of a toddler can tell you. Perhaps someone told Dale Stuckenbruck, “Don’t play with your food!” If so, the direction didn’t work as intended. Nope. He founded Long Island Vegetable Orchestra. Along with other veggie virtuosos, he has a grand time playing with his food. At the Oyster Bay Music Festival every year, he promotes this shocking behavior. Kids in the audience join the orchestra, playing and making their own veggie instruments. What’s Wrong with Playing with Your Food? Maybe nothing. In the Journal of the Academy of Nutrition and Dietetics, we read that “tactile play” might actually help preschoolers accept new foods. Like vegetables. Perhaps taking food too seriously has serious consequences. Veggies become medicine. Medicine is yucky. Gimme the candy. 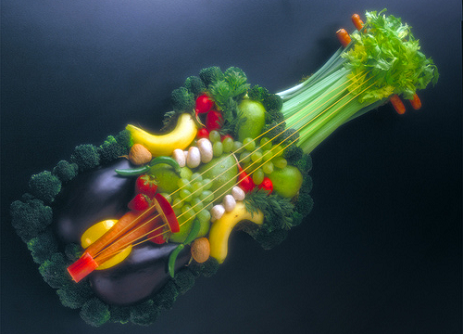 Playing with food – even making music – sounds like a lot more fun. And all of this has been peer-reviewed by toddlers. Guaranteed to work. Click here for more on the Long Island Vegetable Orchestra. For the study of playing with food, click here, and here for a bit of reporting on it.